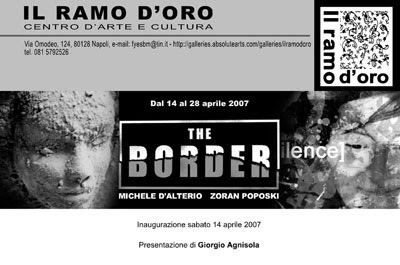 An exhibition by the Macedonian artist Zoran Poposki and the Italian artist Michele D’Alterio opens to the public at the gallery “Il Ramo D’Oro” in Napoli on 14 April 2007. The exhibition is conceived as a confrontation of two expressive experiences, the abstract and expressionist one of Poposki and the surrealist and conceptual one of D’Alterio. Poposki exhibits large-scale digital prints that elaborate the issue of identity and the relationship between images and language/text/narratives. Zoran Poposki has exhibited in New York, Paris, Berlin, and Macedonia. He has attended residency programs in the US and in Austria. The exhibition in Napoli will be open until 28 April. Review in the newspaper "Il Mattino"